Can you make donuts from matza? A Whole Foods in Foggy Bottom, DC decided that all Jewish holidays are pretty much the same. 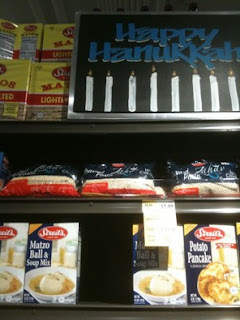 So for the Hanukkah display they loaded up with all things "Jewish" so that means matza, matza ball soup, etc. But I take this as a challenge. Can someone please please please make a matza donut? If you can, this may revolutionize Passover.